Mohammed Ali Jinnah, the founder of Pakistan, was a man of broad vision, towering intellect, wide outlook and impeccable manners. lf he is held against present Political backdrop of both India and Pakistan, it is difficult to find any man who can live up to his image. 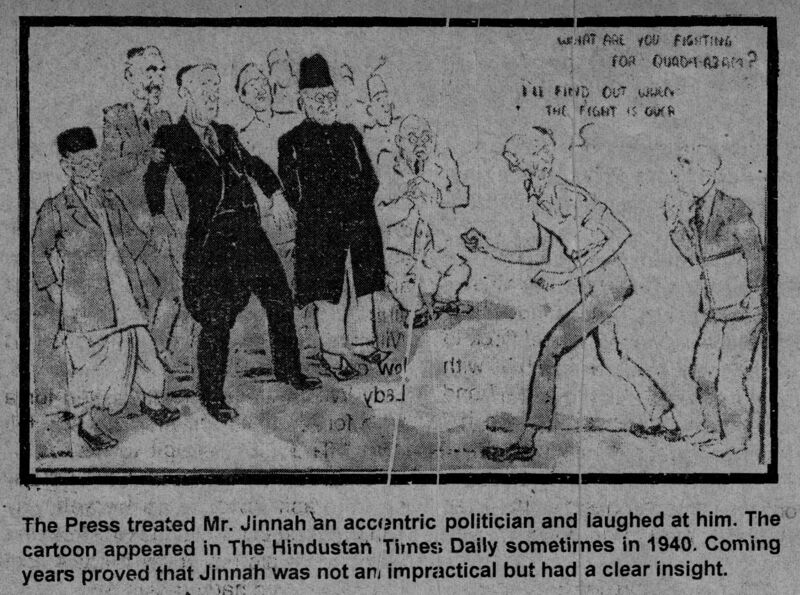 However, the Quaid too had his own "temperamental short comings. He was known for his quick temper and, had no regards for the "inner light" of Mahatma Gandhi. Though an avid reader of Shakespeare's plays, he would live in the world of concrete reality and not that of spacious imagination. 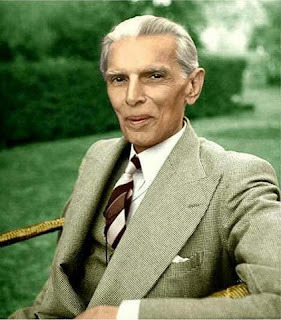 SHAISTA IKRAMULLAH, an old associate of Jinnah in conversation with ASHOK MAHADEVAN, draws all the nuances of Jinnah's personality and that too in keeping with the principle of objectivity. l had been invited by the government to represent India at an international peace conference in San Francisco, but the leader of our political party was telling me I shouldn't go . His reason : our party, the Alllndia Muslim League , was committed to noncooperation with India's British rulers; as a disciplined Leaguer, I could not be Part of a government delegation. That encounter took place in 1945, but even today the wonder of it moves me. There was Mohammed Ali Jinnah, the founder of Pakistan and the revered Quaid-i Azam (Great Leader) of tens of millions, taking the trouble to teach one of his junior most followers the valuable lesson that commitment demands discipline and sacrifice. The Quaid was not this amiable with every one. He was a shy man and, like most serious people, smiled rarely. Because of his towering intellect and reserved ways, most people were at awe of him. Many senior Muslim Leaguers didn't dare see him without an appointment . With his Younger followers, though, the Quaid’s kindness and patience showed through. Often, eager to understand his point of view on a complex and controversial matter, l'd drop in on him without notice, Not once did l get a brush off. And once, hearing that Mohammed Noman, secretary of the All India Muslim Students' Federation, could mimic him well, the Quaid sent for him, "Show me your act, " ordered the Quaid. Embarrassed Noman went through his routine. When he finished, the Quaid said with a smile," Very good. Theh he handed Noman his, Astrakhan hat and monocle. "Take these ," he advised, "They will make your act more authentic." I felt a great sense of reassurance whenever I was with the Quaid because he was absolutely convinced about the validity of his beliefs. ln a man of less integrity and intelligence, such self assurance would have been conceited. But in the Quaid it was comforting. One felt sure that, with him leading us, the culture and political rights of India's Muslims were safe. No wonder, then, that the Quaid's charisma drew so many young Muslims into politics. lf I'd have never met him, I doubt lf l, the wife of a senior bureaucrat and used to a privileged life, would have ' joined the freedom struggle. Born on December 25, 1876, Mohammed Ali Jinnah Bhai (he later shortened it to Jinnah) was the eldest child of a well to do Kachchi merchant. To his father's despair , young Mohammed regularly cut classes, preferring to study at home at his own pace. Finally his father apprenticed him to a London business firm. Mohammed's mother agreed on the condition that he'd marry before he left. So in 1897, 16 year old Mohammed had an arranged marriage: "Probably the only important decision in his life, " his sister, Fatima Jinnah, has written, that he allowed to be made by others." Not long after arriving in London, Mohammed abandoned business for the law. He wanted an intellectually challenging profession through which he could enter public life. Furious, his father ordered him to return at home at once. That had no effect; as his father had given him enough money to support him ' for' three years. While in London, Mohammed listened to debates in the house of commons and was deeply influenced by liberal politicians. He also fell in love with theatre; throughout his life he remained a devotee of Shakespeare. Indeed, the Quaid belonged to that generation of Indian's who, after study in England, took whole heartedly to the British way of doing things. ln his elegantly cut Seville Row suits with a monocle in his right eye, he 'even looked like an English aristocrat. He was Western in many of his attitudes too: he was a sticker for punctualis, and scrupulous in business matters. After three and a half years in England, Mohammed sailed for Karachi in July 1896. His home coming was grim. When he had been away, his mother and his wife died, and his father's business was on the verge of collapse, Though two Karachi legal firms were eager to hire him, the young barrister chose to seek his fortune in Bombay. Once established as a lawyer, Mr. Jinnah began taking an active role in politics ironically, by joining the Indian National Congress in 1906 and becoming an enthusiastic advocate of Hindu-Muslim unity. lf the two communities joined hands, he argued, more pressure could be exerted on the British to leave; but gradually after many rebuffs from the congress, he came to the conclusion that Muslims would never be fairly represented in a Hindu dominated India. He therefore became an eloquent advocate for the creation of a new nation Pakistan to be fashioned from the Muslim majority provinces of India. The two men also differed on political tactics. The Qauaid believed in gradual, orderly change. Gandhi's ; weapon of mass, civil civil disobedience, the Quaid predicted, would result in increased violence and bitterness. At the 1920 session of the Congress' 'when. the Party overwhelmingly adopted the Gandhi tune, the Quaid 'dissented vigorously. "' Your way is the wrong way,' he told Gandhi, " The constitutional way is the right way ." The Quaid regularly spoke out against the government's arbitrary use of power, pointing out that preventive detention, political censorship and the breaking up of peaceful gatherings were violations of rights the British themselves had struggled for in the First World War. He censured the authorities even when it was his political opponents who were the objects of repression. Although the Quaid represented the rights and liberties of the Muslim people, he never Pretended to be an orthodox believer. When one crowd hailed him as such, he retorted, "I'm not your religious leader, I'm your political leader." Indeed, the Quaid had defied Muslim convention by sending his sister to a catholic boarding school for girls respectable Muslims those days educated their girls at home and later by encouraging her to study dentistry. lt was also largely due to his support that so many Muslim women like me became politically active. Religious fundamentalists may have disliked the Quaid, but the Muslim masses adored him. Tens of thousands of poor, illiterate people would flock to his public meetings, greeting him with deafening cries of "Allah-o-Akbar" and "Quaid-i-Azam Zindabad." Since his Urdu was halting, he generally spoke in English. Despite not understanding a word, the immense crowd would listen to his clear, measured voice in rapt attention. Though the Quaid's hold over the masses gave him great power, he never abused his position. At a 1942 League session in Allahabad, it was proposed that the Quaid be the sole Muslim League representative to negotiate with the British government and be fully empowered to make decisions regarding ' the future of the Muslim nation: lmmediately Maulana Hasrat Mohani, a maverick Muslim League leader, protested. "The Quaid is not a dictator," he cried, "He shouldn't be given such authority." As pandemonium broke loose, the Quaid suddenly appeared at the microphone, calling for order. "The Maulana has every right b express his views, "he said. "You can also do so at the time of voting." The resolution was passed overwhelming , but in fact, the Quaid never acted without the Muslim League Council's willing concurrence. For the Quaid, honest difference of opinion was one thing; a deliberate slight, quite another. Soon after his second marriage in 1918, he and his wife, Ruttie, were invited for dinner by the governor of Bombay, lord Willingdon. Rittie Jinnah was wearing a low cut dress, and at the dinner table, Lady Willingdon pointedly asked for a wrap for Miss Jinnah, "ln case she felt cold. ' The Quaid leapt to his feet. " When Mrs Jinnah feels cold, she will say so, and ask for a wrap herself," he' snapped and escorted his wife from the building. He did not enter it again until the Willingdons had moved out. After Ruttie's death in 1929, Fatima Jihnah took charge of her brothers household and was constantly by his side during the crucial Political battles of the next two decades. ln 1936 the Quaid was invited to lead the Muslim Ledgue. His goal: to unite the Muslims so that when the British finally hand over power, they would not be politically swamped by the far more numerous Hindus. lt was a formidable task, for the Muslims were both poor and unorganized. The Quaid summed up the "problem in a reply to someone who asked why he Stayed up so much later at night than Mahatma Gandhi. "Mr Gdndhi," he said, "can sleep because his nation is awake; I have to keep awake because my nation is asleep." When the Musliin League membership rose from a few thousands to nearly a million. 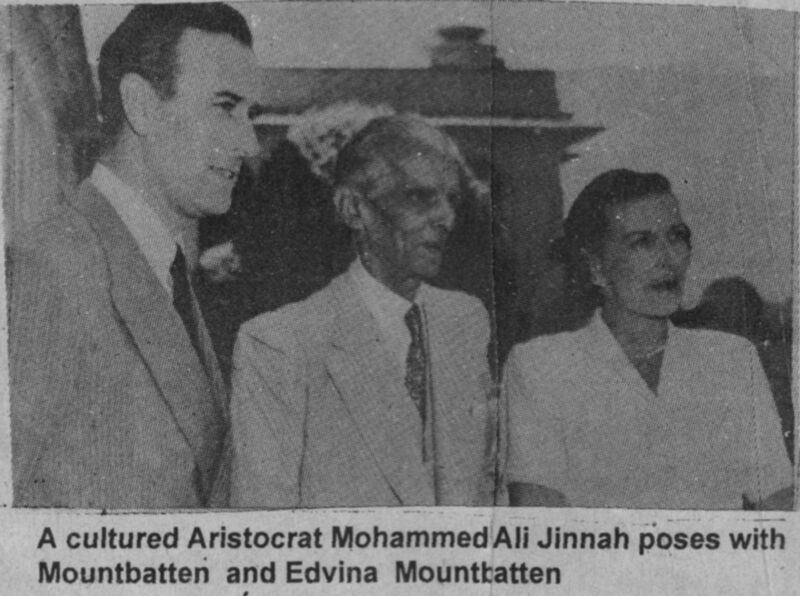 My first encounter with the Quaid was in October1940. My father, then an adviser to the British government, was hoping to bring about some understanding between the government the Muslim League, and suggested that I accompany him in his meeting with the Quaid. I agreed some what reluctantly, for I had heard that the Quaid was arrogant, and I was afraid of being snubbed. I couldn't have been more wrong. The Quaid and his sister, Fatima, were so warm and friendly that I found myself plying the Quaid with questions. As he carefully answered each one, I listened spellbound.' That experience impressed me so deeply that when Fatima asked , me a flew days later if I'd help start a Muslim Women's student Federation, I agreed immediately. As I got more involved with the League, I learned a lot from the Quaid. 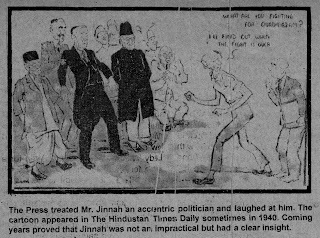 ln the early 1940s, during a period of growing tension between Hindus and Muslims, the Hindustan times printed an article attacking me for taking part in politic despite ,being married to a government official. The charge was unfair since the, wives of many Hindu officials were working for the Congress Party without attracting censure. Seething with indignation, I went to see the Quaid, " Everyday the newspapers say much worse things about me," he said matter of factly, " You must not let small things upset you.'' Ever afterward, when l have faced malicious criticism, the Quaid,'s advice has helped me. ln the 1945 46 elections, the League won nearly 85 per cent of the Muslim provincial seats. Overwhelming proof that the vast majority of India's Muslims, favoured creation of Pakistan . lt was a momentous victory but little did I suspect enormous personal odds the Quaid had been battling against. From the early 1940s he'd been in poor health, and in June 1946 X-rays revealed advanced tuberculosis. The diagnosis was kept a closely guarded secret, for had the congress leaders known the Quaid was dying, they might well have adopted delaying tactics during final negotiations with the British. Without the Quaid, leaders of the League might have succumbed to British pressure and Pakistan might never have come into being. Sadly', I was unable to be in Karachi on that great birthday, August 14, 1947. I arrived in Pakistan in mid September and met the Quaid, now its Governor General, a few days later. He was under terrible strain. Partition had led to wholesale slaughter, and Pakistan, its economy completely disrupted, was also saddled with millions of Muslim refugees from India. The Quaid asked me how I felt. “l miss the skyline of Delhi," I replied. He was silent for a moment. 'l understand," he said, "but would you have kept the stones and monuments and lost the spirit ?" ln August 1948 I was appointed a delegate to a United Nations conference in Paris. The Quaid, realized, was fulfilling the promise he'd, made in 1945. I never got the chance to ask the Quaid what he thought of my performance at the conference. On September 12, while in London, I heard the news the Quaid had died in Karachi the previous day. His last words were the two he had lived by "Allah.... Pakistan."